We have a few exciting bits of news for you regarding Modular Combat 2. Due to circumstances beyond our control Modular Combat 2 will be developed in Unity. We're still early in the development cycle so this does not affect timelines too much. Torix[www.artstation.com] made this model in 52 hours. The entire thing was streamed live and recorded. We're trying to put a timelapse together, but compressing 52 hours of footage into a 10 minute clip would move things so fast that you wouldn't be able to follow anything, so the timelapse will probably be an hour long. We're looking into adding support for other languages in Modular Combat and we need your help with the translations in French, German, Spanish, Russian, Swedish, Simplified Chinese, Traditional Chinese, Korean and Japanese. NOTE: You should only contribute if you're fluent in the language. P.S. Tom G. from Valve is responsible for this change. Please reply here with your thank you's and when enough nice posts are made, we'll link him. The last 10 days (and until the model is finished and textured), André aka Torix has been making the mutated Ucanax model. 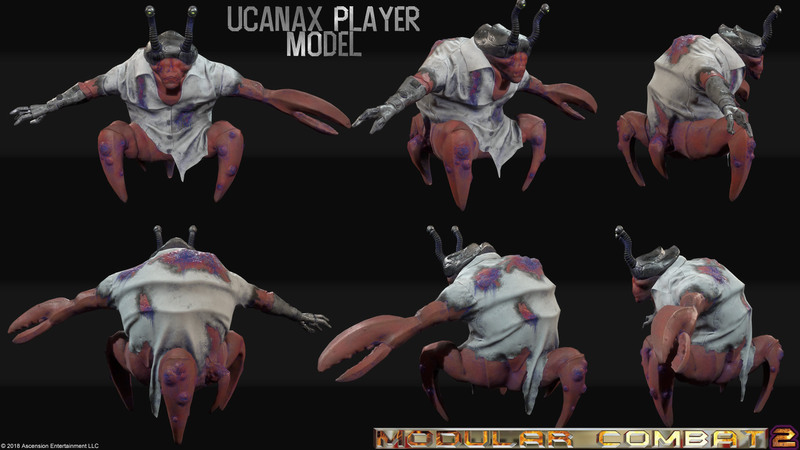 One of our new modelers is just about to start working on the Mutant Scientist (aka Ucanax) model. We are going to do something most game developers don't do; that is show you in real time from start to finish the creation of a 3D character model. Please note that it is a long and slow process so some of you might consider it boring. Starting today, every day at 5PM EST to 7PM EST Torix will live stream creation of this character model. Some days Torix might not be able to work on it so this news post will be updated if that is the case. If you aren't able to watch in real time, then you can watch the archived videos. Torix has prepared an introduction where he describes the process he's going to use. You can watch it at: https://www.twitch.tv/videos/159045653. Our new texture artist Mauro has been hard at work these past few weeks and we have something to show everyone. The following shows the textured Nanite player. You will be able to choose any color too (colors included in this image are just examples of how different colors affect the appearance). The image above shows much more detail when you view it at 100% zoom. Click here[preview.modularcombat.net] to see. Note: Weapons will slot into the missing right arm. Question: Will Modular Combat 2 be free? Question: Will Modular Combat 2 have the same teams and take place in the same universe? Answer: No, because Valve owns the IP to the Half-Life universe and licensing it would be too expensive. Question: Will Modular Combat 2 be a Source mod too? Answer: No, Source is too old and waiting for Source 2 to release will take too long (since no one knows when it will be released). So instead the engine will be Unreal. Question: Will Modular Combat 2 have feature ____ that Modular Combat has? Answer: Yes all the features in Modular Combat will be available in Modular Combat 2. The storyline, team names/appearances are the only things that are changing. P.S. If you want to be notified when we make the Kickstarter announcement, please sign up to our newsletter here[eepurl.com]. It will only be used to announce any kickstarter related news. We were originally planning on devloping Modular Combat 2 in the Unity engine but after reviewing shortfall's in it we have decided not to use it. Modular Combat 2 will instead be built in the Unreal engine. Aside from much better graphics quality, the game (and demo) will be more stable. In other news, we don't have any new screenshots to share right now, but in a few weeks we should have something for you. Lately, interest in Modular Combat has been revived with lots of players complaining that the servers are all empty. This event is an attempt to rectify this. Starting tonight and some Friday nights at 7PM EST let's all try to be in one of the official game servers. If a server fills up, join the next one. Full Demo Reveal, New Websites & Steam Greenlight! All 3 teams are aliens. Nanites, Mutant Scientists and Hostile Plants. Map will take place on a space station and include elements from 2 popular maps (dm_richland and dm_runoff). Game will be darker, not quite horror but not quite happy either. The team names may not be final ones and may change during development. The Modular Combat website has been redesigned and the Modular Combat 2 website is finally up. Our next concept art reveal is one of the Nanite weapons. This weapon is called "Freezer Burn" and it fires shards of ice which explode mid-air into smaller shards. Do enough damage and your target will freeze solid for a few seconds. In an effort to optimize the game so it's playable on as many computers as possible we encourage you to fill out our Hardware/Software survey here[modularcombat.net]. Information is non-identifying and kept confidential. If you want to be notified when we make the Kickstarter announcement, please sign up to our newsletter here[eepurl.com]. It will only be used to announce any kickstarter related news. Play as your favorite faction in the Half-Life universe. In team based gamemodes, help teammates with special team specific perks. Defeat your enemies with all the weapons in Half-Life 2 or use modules such as cloak, turret, jetpack, teleport, minions and much more! Gamemodes drastically affect gameplay by introducing new objectives. There are 5 gamemodes that let you fight players, other teams, monsters or both. France servers do not appear in the steam server browser. © 2018 Ascension Entertainment LLC, Modular Combat, the Ascension Entertainment LLC logo and Modular Combat logo's are trademarks and/or registered trademarks of Ascension Entertainment LLC. Steam and Half-Life 2 are a registered trademark of Valve Corporation and is used under license from Valve. All other trademarks are properties of their respective owners.